25002 at Polmadie on July 5th 1980. 25002 has about five months remaining before final retirement. The nineteen year seven month career of D5152/25002 was spent allocated to depots on both sides of the Pennines and north of the border (ER, LMR & ScR). Time between last Classified repair and withdrawal: 25 months. November 1967 to Carlisle (12A) on loan, made permanent December 1967. October 1972 to Haymarket (64B). June 10th 1977 to unserviceable store. June 21st 1977 reinstated to Eastfield. 25002 was the 62nd Class 25 withdrawn, one of seventeen retired during December 1980, including sisters 25005, 25006, 25010 & 25011. 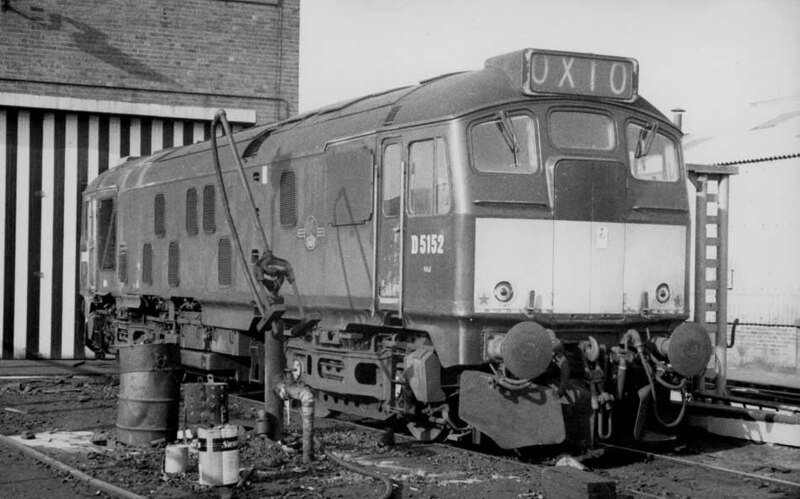 These were the last Class 25/0 to remain in service. After withdrawal 25002 was stored at Eastfield until moved with 25005 to Swindon Works on March 7th 1981 and broken up there by the middle of April 1981. Noted Darlington Works August 1962. Noted Glasgow Works June, August & October 1978 (continuous?). Photograph courtesy Bill Wright. Steam is not quite gone, the majority of the diesels are still green and freight trains can still produce an awesome variety of wagons. 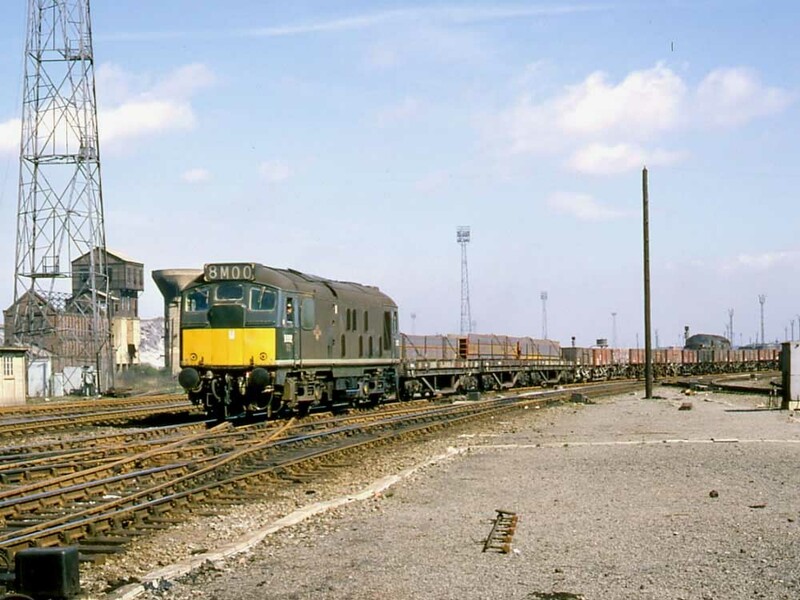 Its April 17th 1967 as D5152 leaves Tees Yard with what appears to be a lengthy train of steel products. Although the cab front and cab sides have been cleaned the remainder of the locomotive is coated in layers of dirt & dust. D5152 would spend just over five years allocated to Thornaby. D5152/25002's first recorded passenger workings took place on August 2nd 1969 with the 10.00 Sheffield - Llandudno Town and the 14.28 return. Photographer unknown. A well worn green liveried D5152 catches the sun at Derby Works sometime in 1969. Although not boiler equipped the sub group carried a through steam pipe - the piping and connection clearly visible in this view. Photographer unknown. 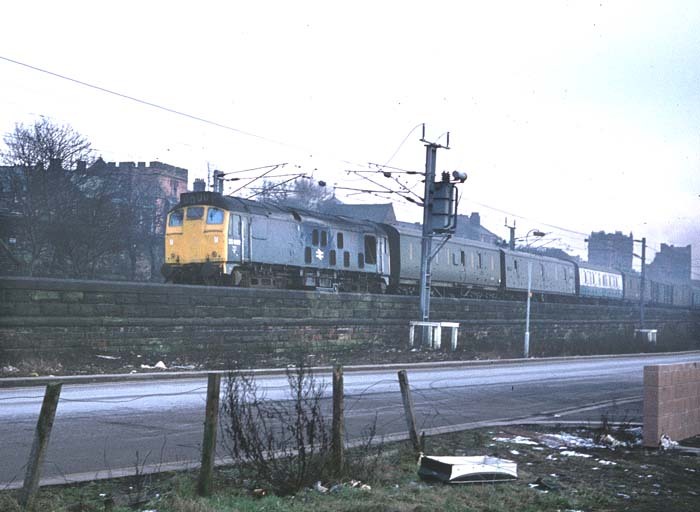 25002 accelerates away from Carlisle with a parcels train February 10th 1978. Four years allocated to Longsight brought a few passenger workings. On March 11th 1972 the 14.40 Manchester – Harwich failed near New Mills behind 5619. A following Northwich – Peak Forest limestone empties with 5152 buffered up to the failed train, pushing the eight coaches and locomotive to Chinley where 312 was waiting to take over the passenger working. On August 12th 1972 5152 & 7598 worked the 08.48 Manchester Piccadilly - Skegness and 15.04 return. Photographer unknown. 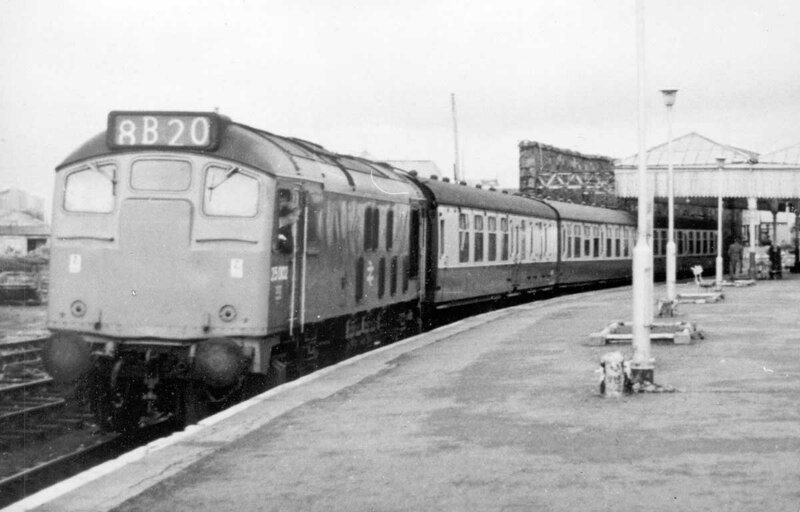 25002 and three coaches at Mallaig, date unknown, but possibly whilst 25002 was allocated to Haymarket between October 1972 & May 1974. On July 20th 25207 & 25002 worked a 8P69 Thoresby - Foxton coal train and returned as a 8G00 special. Unusual visitors to Exeter on September 5th were 25083 & 25002 on the morning freight from Bescot. The evening Huddersfield - Wakefield parcels was worked by 25002 on November 28th, this was diagrammed for a Healey Mills Class 40. 5152/25002's first round of allocations to the Scottish Region have so far produced no records of passenger workings, but on its return from its one year allocated to Tinsley, it did pick up some passenger turns. On October 6th 1975 25002 worked the 10.10 Glasgow Queen Street - Aberdeen. A new contract to move pipes from Leith Docks to several long distance locations including Derby, Wisbech and Salisbury, and shorter hauls to Carlisle, Darlington, Law Jct, Maud & Montrose would provide much work for pairs of Haymarket Class 25’s. The Leith – Salisbury diagram involved the Scottish Type 2’s working as far as Didcot, examples noted were 25002 & 25317 on March 27th, the locomotives generally returning north light, at least as far as the Birmingham area. April 23rd found 25002 at Saltley, far from its normal Scottish haunts, possibly laying over from one of the pipe train workings? 1979 produced a varied set of workings, beginning on June 23rd with 25002 & 25083 in charge of the Edinburgh - Perth leg of a railtour to Kyle of Lochalsh. A week later (30th) 25002 handled the 11.05 Perth - Edinburgh. The 09.20 Glasgow Central - Morecambe was worked throughout by 25002 & 25082 on July 7th 1979. The 07.38 Dundee - Glasgow Queen Street was worked by 25002 on July 23rd 1979. September brought a couple of short workings, on 5th with 25023 on the 21.30 Euston - Fort William between Mossend Yard and Cowlairs Junction and on 20th with the 22.45 Carstairs - Edinburgh. 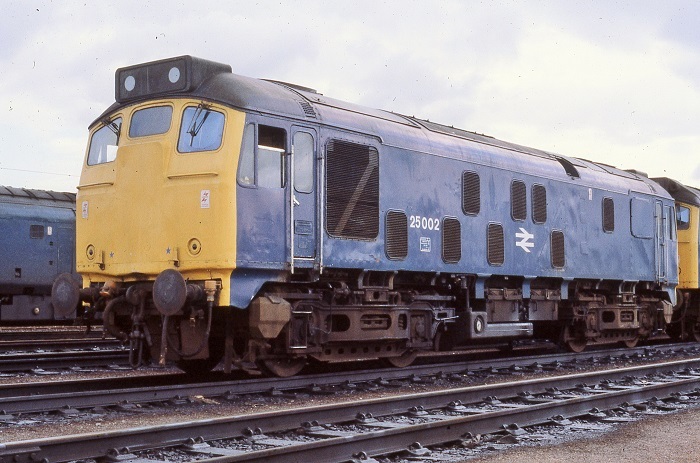 1980 was the last year in service for 25002, at least three workings have been recorded during the summer months. On July 19th 25002 worked the 08.10 Glasgow Queen Street - Scarborough to Edinburgh, returning with the 15.15 ex-Scarborough. The final passenger working took place on August 12th 1980 with 26040 on the 10.14 Perth - Motherwell. Scotland was finally cleared of the last of the Class 25/0s, during the first week of March 25002/005 made the long trek from Eastfield to Swindon Works. Condition final: blue/yellow livery, gangway doors sheeted over, shortened fuel tank - circular gauge fitted, no water tank, blanking plates fitted, hand/footholds plated over, ridge sided sandboxes, two-rung bogie mounted footsteps. Page added June 25th 2013.